I love the routine of the school year. I took a day off yesterday to get my home back into order from the summer chaos. I love order. If you had visited my home you would have said “LIAR!”…. ever have those weeks? Order is on it’s way to being restored, I may need the whole holiday weekend. Yes, even the owner of a cleaning service.. LIVES in their home! Congrats to our Winners this month! This Months Special:Clean up those VENTS! Tis the allergy Season! This months special is just what you need to keep the clean air flowing in you house with clean Air Conditioning Vents. Attached to your regulatory scheduled clean, just an extra $7 per vent gets you all Freshened up for the change of season! Bev received a Bouquet with each flower representing how much we all appreciate her! She also received an $80 gas card and a coveted parking space! Way to go Bev!! Perfect for those old wire hangers taking up space! 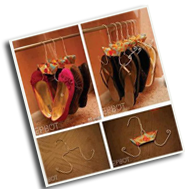 Great shoe organizer/hanger! Get some extra closet space with this trick! 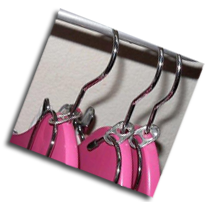 Just add pop tabs to hangers to hook an extra hanger! Tired of searching for matching sheets? Fold you bed sets into the matching pillowcase! 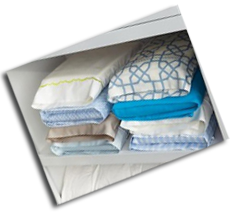 Keeps them together for easy storage and even easier find! So Smart! We are expanding our commercial service THIS month we are offering a $100 Credit for future cleans to those that refer us to your place of business! Enjoy CLEAN toilets at work from Absolutely Clean! Call today to talk about how we can make a difference. Cleanliness counts for first impressions! Because of your Ohh So generous donations (4 huge tables full!) Absolutely Clean has been able to spread out school supply donations to all of our local schools! Thank You isn’t enough for all you have done for so many families! Your the BEST! Lots of new faces at Absolutely Clean – Bev has been with u s a short time and is already employee of the month for the second time in a row! 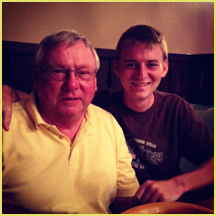 Nick has left us and is currently on vacation with some friends before he flies to boot camp on Wednesday. He was the spark behind the amazing growth in our commercial division and his charm and easy going nature is already missed. He has a great career ahead of him as a “nuke” in the Navy. You are a great asset to our country. Thank you. Get Your Cling On!! Congrats Shanna Mosey, winner of a YEAR of free cleaning for having a cling on her car! — Do you have your cling on yet? Join in Absolutely CleansCar Cling Giveaway! Get spotted around town with your Car Cling and you could win a FREE CLEAN! 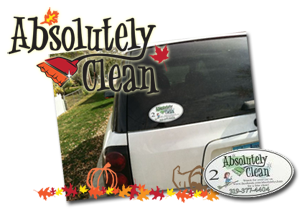 Stop into Absolutely Clean and get your Car Cling today. Or if your a current client of Absolutely Clean we can drop a Car Cling off the next time we clean! We will post a picture once a month of a car spotted with its Cling, so keep an eye on Facebook to see if your a winner! Absolutely Clean got together with local business That One Cupcake Place for some extra sweet giveaways this month! All you had to do was fill out your client survey to be entered! Special Thanks to That One Cupcake Place for making the giveaway such a sweet success! 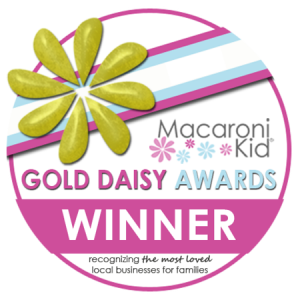 So Delish!Congratulations to Lynne Abbott! She is receiving cupcakes from That One Cupcake Place for her Client Survey return! Keep Sending in those surveys and you could be the lucky one to win a special treat next month! Thank You, Thank You, Thank You! To all those who made our Community Appreciation Party and Time in a Bottle Fundraiser such a success! We were able to raise over $3000 for Time in a Bottle, with a special anonymous $1000 donation!! 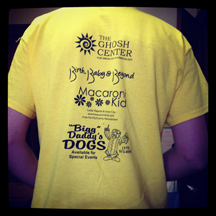 We can’t wait to help local families with your kind donations! Interested in being apart of this years planning committee?? Just email Stephanie@absolutelyclean.org and m ake it to our meeting at Green Leaves on September 18th at 6:00pm. We will be eating dinner-Dutch Treat! We would love for you to join in! Waypoint’s mission is to strengthen and empower individuals who are homeless, living in poverty, or victims of violence; and to help children gain the essential skills vital to reaching their full potential. Anything you can do HELPS!